Beyond its monuments and the busy city life, Tarragona has several preserved areas that have a high natural and heritage value, which are worth discovering with the family. A fantastic way to start the day trip is visiting the Parc ecohistòric del Pont del Diable (Devil’s Bridge ecohistoric park). Parc ecohistòric del Pont del Diable which was built in the 1st century AD is a treasure full of Mediterranean diversity, lives, colours and smells that blend with the imposing aqueduct of Les Ferreres, one of the symbols of the city. Park is known for its numerous hiking routes and picnic areas so it’s a great option for outdoor family activities. If there’s one thing which really stands out about Tarragona, it’s the Roman archaeological site – remains of the impressive city of Tarraco. 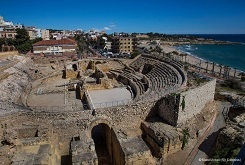 Visiting Tarragona’s monuments like the Roman amphitheatre and circus and exploring the city walls are both great ideas which are both fun and educational. In Tarragona, all members of the family can learn and enjoy the city at the same time, which paints a detailed picture of the history of the Mediterranean. If you prefer a beach activity, you may be interested in the Tarragona Family Kayak, a water activity especially created for family groups and available to do in the summer. Departing from the marina, after having learnt a few basic instructions on the kayak, you can then enjoy sailing along the coastline and past the beaches of El Miracle, l’Arrabassada and La Savinosa in a fun way and from a new perspective. The kids would definitely love this. Stop by to have lunch with your kids at the restaurant Pulvinar, one of Tarragona’s most traditional Pizza restaurants. It is located above the presidential stands of the Roman Circus, where the chariot races took place. Most of the city has actually been built over the centuries making use of the imposing structures of Tarraco, the ancient Roman capital of Hispania. Enjoy this beautiful Catalonian city while you stay at our family aparthotel in Vilanova.